Whether you are a sweetheart or have a sweetheart, you deserve to treat yourself on Valentine’s Weekend. We’re offering you (accompanied or alone) a pizza, a salad and 2 glasses of wine for only $22. With all the savings, you’ll be able to splurge for that Nutella Trifle. 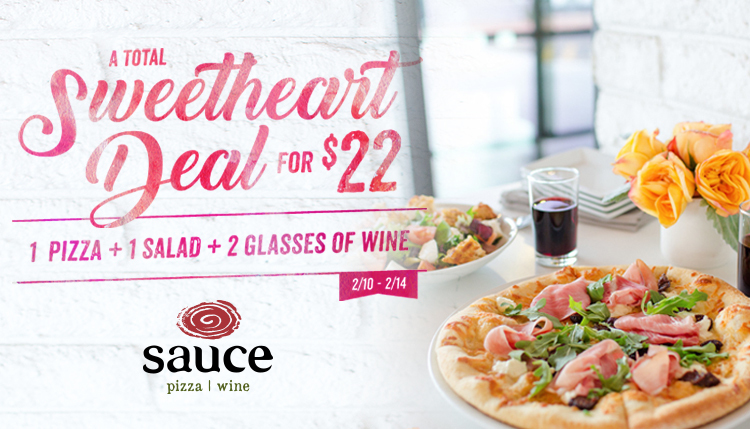 Our $22 Sweetheart Deal will only be available Friday, February 10th thru Tuesday, February 14th. So stop by to indulge with your sweetheart or enjoy a glass of wine for a night out with friends! We wish you a delicious Valentine’s Day! Find your nearest Sauce location here. *One salad ($9 or less), one pizza ($11 or less), and two glasses of wine ($6 or less) for $22. Can substitute the salad for any entrée ($9 or less) or the wine for any other beverage ($6 or less).